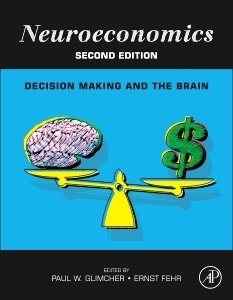 In the years since it first published, Neuroeconomics: Decision Making and the Brain has become the standard reference and textbook in the burgeoning field of neuroeconomics. The second edition, a nearly complete revision of this landmark book, will set a new standard. This new edition features five sections designed to serve as both classroom-friendly introductions to each of the major subareas in neuroeconomics, and as advanced synopses of all that has been accomplished in the last two decades in this rapidly expanding academic discipline. The first of these sections provides useful introductions to the disciplines of microeconomics, the psychology of judgment and decision, computational neuroscience, and anthropology for scholars and students seeking interdisciplinary breadth. The second section provides an overview of how human and animal preferences are represented in the mammalian nervous systems. Chapters on risk, time preferences, social preferences, emotion, pharmacology, and common neural currencies—each written by leading experts—lay out the foundations of neuroeconomic thought. The third section contains both overview and in-depth chapters on the fundamentals of reinforcement learning, value learning, and value representation. The fourth section, “The Neural Mechanisms for Choice, integrates what is known about the decision-making architecture into state-of-the-art models of how we make choices. The final section embeds these mechanisms in a larger social context, showing how these mechanisms function during social decision-making in both humans and animals. The book provides a historically rich exposition in each of its chapters and emphasizes both the accomplishments and the controversies in the field. A clear explanatory style and a single expository voice characterize all chapters, making core issues in economics, psychology, and neuroscience accessible to scholars from all disciplines. The volume is essential reading for anyone interested in neuroeconomics in particular or decision making in general.